Two weeks ago I picked up a second hand Katabatic Master. Actually is was the very same kayak I paddled earlier this year. Now what changed my mind? The color! No not really though I do like my kayaks to be red and white. No I got the kayak for a good price, which means I dare to rearrange/rebuild the deck around the cockpit. Watch out for the Katabatic rolling machine! Considering I've got zero handyman skills, this promise is bordering on hubris. I did consistently forward/forward style roll the Katabatic last week but I want a ultra low rear cockpit coaming(1.5 cm freeboard) to allow a sculling roll. Not your average K1 rudder. Hi Peter, It is a nice idea to be able to roll a kayak. I had a Rapier 20 and had some problems when I paddled with small swells in the back. One possible solution is to have rudder like on the Katabatic, or a surfski rudder since the standard rudder is coming upp in the air when paddling in waves. So it would be nice to hear from you about your experience of wave paddling the Katabatic. Olafur, I agree with you that the overstern rudder with which Valley Rapier 20 is equipped, doesn't perform very well in larger waves. Especially when surfing. However, given the outstanding stability of the Rapier, you can steer the kayak also by edging (heeling) the hull. Anyway, an understern rudder would do much better. Peter, have you had opportunity to test the Rapier 20? It would be interesting to know whether there are great differences in open water performance of Sipre Katabatic Master and Rapier. What I can tell is that initial stability of the Rapier is somewhat similar to Tracer, but the Rapier has much more of secondary stability. For a 10 km race I'm able to hold average speed close to 12 km/h in perfect conditions - and I'm not one of those superhuman racing paddlers (more like an average guy, I would say). Btw, the Rapier is also quite easy to roll, given that you come up from the windward side. Otherwise there will be some difficulties on windy conditions due to generous freeboard. Olafur, I have yet to paddle the Katabatic in waves. I might get a chance this weekend. I'll report back. You'll see the bow of one of the kayaks has no contact with the water. Actually the Rapier is one of our club's kayaks. Despite being only 45 cm wide, it has as almost as much cargo space as Inuk has. Lots of buoyancy, one could say. It's quite fast even when loaded with all the gear for a weekend trip. But if you load it nose down, it feels like a log. My main interest for Sipre is that I'm looking for "Rapier double". 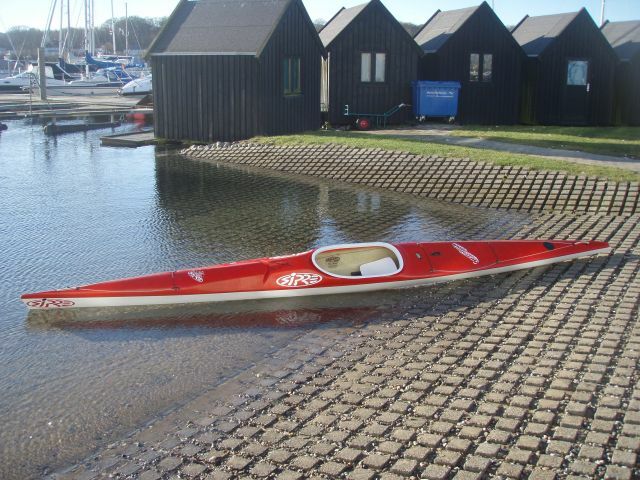 If Sipre models have similar qualities, their double kayaks could be ideal for "a little quicker" weekend trips. I paddled both boats (the Rapier20 just for a few kilometers). I found the Rapier to be very stable (primary and secondary stability), more stable than Turkayaks like the Escape or Civet Cat (sorry, I never paddled a Tracer). I found it to have about the same stabilty as my old P&H Spitzbergen. These Katabatic and the Rapier are not compareable. The Katabatic M is much less stable and potentially faster. The Rapier is a fast seakayak but not at the same level as todays searacers like the Katabatic (or others). The Katabatic (all models) has fixed foam bulkheads and no cargo space but the Millenium II has proven to be fast and suitable for tripping. Alternatively I would recommend you to have a look at the adventure racing doubles from JKK, Isomniac or Ruahine for fast doubles. Nothing for fast tripping or open water racing/training. On my opinion the Rapier has slightly less primary stability than tour racers like Escape, but much more secondary stability. I would compare it to a Wavehopper (WWR trainer kayak), but it has better directional stability (it keeps it's course) and is faster. Speaking of speed potential of a sea racer, I think that stability and surfing capabilities contribute as much as pure flatwater performance do. 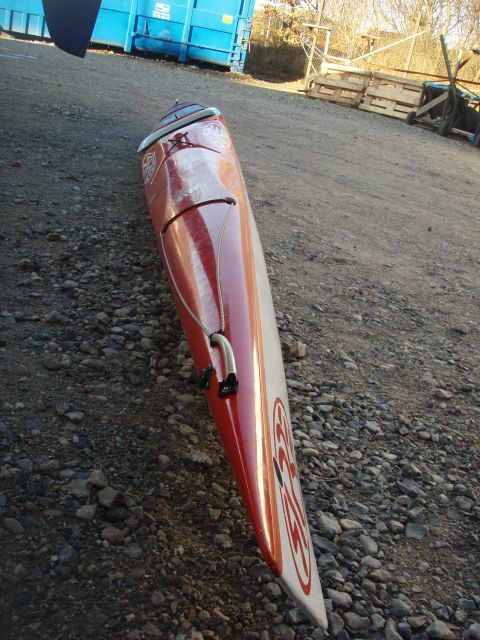 If there would be race where the conditions would be, say, 12 m/s wind from Baltic Sea and wind waves of 2 meters maximum, I think I would be faster on an Inuk than on some of those "pure" sea racers because I would feel extremely unstable on those (given the fact that I'm able to race on older ICF kayak on semi-flat conditions). One of our club's top-level athletes has paddled the Rapier as well and his approximation of speed difference between his Vajda Supersonic ICF racer and Rapier would be some 2-3 minutes per 10 kilometers. Now, if those "real" sea racers are have much more (flatwater) speed potential, they should be very close to ICF racing kayaks, right ? So, how fast can one paddle a 10 km race with real sea racer, on easy conditions ?? Rauli, you are not a average person when you are able to hold 12 km/hour average speed on Rapier. In my old Rapier(23 kg), I was glad to hold 11 km/hour for 3 km!! Even tough I tryed to change the seat position and the hight of the seat I was only able to reach 14 km/hour and spitting blood afterwards. Now I am paddling my Ruahine OceanX(16,5 kg), which is great in waves but is slightly slower than the Rapier. This boat is 640 cm long and built to go fast in waves, still I would like to try it with a understern rudder. The regulations here in Iceland say that you can´t compete in ocean racing if the boat does not have for- and aft- storage!! So I am dreaming about a faster searacer, with hatches and understern rudder. Here are some pictures from the Icelandic "Hvammsvikur" marathon race (1999-2007). There can be rough conditions with 10 min. pitt stopps after 14,7 km, 13,5 km og 11,8 km. I have noticed that we have some kayakers with experience about rapier 20 and ruahine oceanX. Hi Rolli. As I said, my old Rapier 20 was the cheapest version or 23 kg, I dont know how the lighter models are. 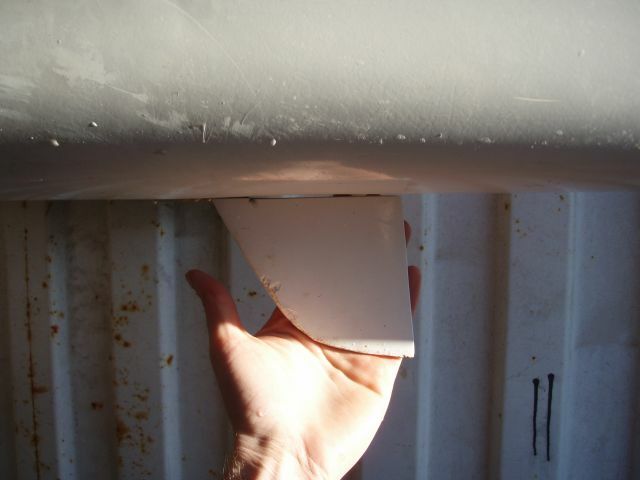 I am 190cm and 92 kg so the waterline was not optimum, I think. There is a guy I know paddling a Rapier, he is ~75 kg and this boat suits him a lot better in every way than me. The secondary stability is good, but the primary stability is not good. You have to be constantly paddling. There are 5 Rapiers 20 in Iceland, and some are for sale because their owners have not been able to handle them or they dont feel good in them. It takes time to get used to them in waves and you have to put a effort in it (medicine ball training on land ect.). People dislike the seat construction because you are not in ergonomic position and they either change the seat or get rid of it. My OceanX is much better for me, but it is a litle bit slower. Also every detail of construction is better from the manufacturer than Valley, perhaps thanx to the deseased Mike Rowley. For rough conditions or open sea paddling the Inuk is the best, one thing about Ocenax is that it is 640 cm long and its overbuilt is a bit high so like the Rapier it is not good when it is blowing. The stearing system is the best I know for any kayak in the Oceanx. Thank you very much for your fast reply. I think I must look closer at the ocean X. the problem is that I live in Finland and they do not have any retailers of ocean X here yet, Sweden is the nearest retailer of ocean x for me. but they do have retailer for "valley" rapier 20 here in Finland. I am about 180cm and 70 kg. And yes I do like the inuk very much. So I just have to wait and see wkat I do in the future and perhaps I find somewhere I can try both kayaks and see which one suits me better. hello Peter, i am a kayaker Italian coming from the swim that has begun late the practical of the kayak. I follow a lot your blog, and your evolution from the seakayak to sea races and flatwater races.. I have 67 years, I am high 180 cm and 83 weight Kg. Having begun to 50 years I have problems of "balancing"
I make contests in flatwater and in sea, I train myself with the athletes of my club to Livorno, that it is on the sea but has also of the channels for the training in flatwater. Mine kayaks:two trainer like "Escape or" Nelo Razor", a" Tracer", a FW2000 and a Lancer.Ho lowered to the maximum the seats of all the kayak and I have put a cockpit from olympic on the mosquito one. It compliments for your evolution from sea kayak to Vajda Supersonics and also for yours forward stroke, I in flatwater do not go beyond the Tracer and with the Lancer I go a bit slower. Saying all this you I would be pleasing if you answered me to some questions on several types of kayak.Is convenient buying a Rapier or is too much tippy?quale speed from to the Rapier regarding the Tracer and which the stabilities? Which you know thing to say to me on a surfski like the V10 or Huki-s1x? In attended of one your answer on blog you salute and to thank you for this favor. Hi Rolli. That is the best way to do it, try the boats before you buy them. I would say, with all due respect, that at your age paddling a Lancer is quite an achievement. It is my impression from danish clubs, that the Tracer is at the very upper end of the stability-scale for the vast majority of paddlers. I haven't paddled a Rapier but based on Rauli's comments on this page, you should feel at home in a Rapier. I doubt you'll be any faster than in your Tracer. Perhaps the Rapier is better behaved in waves but it'll also likely be a good deal more heavy. I have test paddled a Epic V10L(which is the edition you would want) and as for stability it was somewhere in between a Tracer and Lancer. You maybe be faster on the Epic ski and considering the warm weather in Italy you might enjoy paddling more. if you are using your boat mainly for fast tripping on the sea, I would suggest to keep your Inuk for that purpose. However, if you intend to use the kayak mainly for exercise, do test the both before buying. I've heard that the local dealer in Finland, B&W has one Rapier in their shop at the moment. It is good time of the year to test the Rapier - if you feel comfortable in it now when the water has already frozen on some places, then you will feel comfortable in it on almost any conditions. I think the Rapier and similar kayaks are more useful than surfskis for paddling in sea conditions only if two conditions are met; water is cold enough that you dont want to swim in it, and you are able to roll the kayak reliably. In waves the Rapier is clearly faster than the Tracer, but I guess it is slower than a modern surfski (they say that the hull of the Rapier is quite similar to so called "lifesaver spec ski" which is said to be slower that modern competition ski). Hi Peter, thank you for the answers.Also my idea was not to have much to earn with the Rapier regarding the Tracer. Paddling on the Lancer would be good thing but with seat more high. Mine seat it is so low that I feel pain to the hips. Idem for FW2000,but the Lancer is a bit more narrow.I would want to be useful for yours kindness for having answers to others my questions. I have bought 3 years ago a Dansprint that use in my garage.In Italy uses a lot the Concept2 but I prefer the Dansprint, but think that penalizes a bit the performances .What is your opinion?What is yours effort on % in the test of the video(31 min=5650m)? In Italy there are a lot"Vanquish and Paddles Bracsa(1 and6).Why uses the Supersonics? Is it faster, more stable or...? Also Rauli advises the surfsky but in italy not there are retailers and then one stability between Tracer and Lancer for the V10 ago to think difficult for me.Perhaps a V10 sport? Paolo, as for the Dansprint ergometer I haven't done comparisons with my speed on the water. We're always doing interval training on the ergometers and always maintains +12km/h in long intervals(3-5 minutes) and somewhat more in short intervals. I think this isn't too far away from real kayaks in real water at our level. Now that you mention the Concept2 ergometers, I think most would agree that the C2 is better build and higher developed than the Dansprint ergometers. If I wasn't a kayaker, I would surely pick the C2 over the Dansprint for cardio indoor exercising(assuming I even would want to do indoor cardio). One does wonder however why "everybody" paddles a Vanquish though? Is it because of a superior design or are race kayakers scared to test new designs? The new Van Dusen/Epic range of kayaks deserves a chance IMO. Rauli, good info on the Rapier. It is not fair comparing stability of a surfski to a racing kayak, if you fall of the surfski you will be up paddling again in half a minute -in any sea! Regarding water temperature: we are still paddling V10s in Norrköping, Sweden. All you need is a long-john wetsuit, i still lets you rotate quite ok. In Sweden you canuy surfskis from www.nomado.se, they have V10 in stock. Still a beginner... but reentering is no problem. No big difference between flat water and waves (so far i only remounted in less than one metre vawes). Look at the vawes they do i South Africa and reenter (www.surfski.info). I consider paddling in cold water safer in a surfski than in a sit-inside kayak! thanks for the answers and thanks also to Wildenstam for the address(unfortunately in Swedish). I must say that the formula of the 2 tenth for every kg was obtained from a search of the Federation on kayakers with weights additionals.I asked your opinion why to me it seemed too favourable. In your example:t=270s R=52.67N and W=195W.If you maintain the same power and you lose 10 kg :195/k=v^3 and with k=3,74 v=3.736 t=1000/3.736 t=267,6.Un gain of only 2,4sec. With regard to the dispute on the length of the boats I think that over 80 kg the length of 5.2 m begins to being not optimate.Io would apply the rules of the rowing with length free and fixed weight.Your opinion? I paddled a rapier 20 for 2 years. It was carbon/kevlar and weighed about 18kgs. The rudder slows it down so I changed it to a stainless steel one I made and the speed increased a little. This kayak used to hold the world record for the fastest solo canoe/kayak of the english channel with Ian Tordoff. It's now held by Ian Wynne who paddled a Fenn Mako 6 surf ski. I found stability was very good when moving and was cought in 60 kph winds 4 kilometres out to sea but the kayak and me managed it OK, although it was a little scary. These are fast sea kayaks but there is always a narrower kayak that goes a bit faster but at a cost of stability. The Katabatic is just a K1 a bit longer and a smaller cockpit. I would say buy a rapier 20 if you can and practise using it. On my opinion the Rapier 20 combines stability and speed very well. On flatwater it is about 1 km/h faster than most fast sea kayaks. When things get rough it is only slightly less stable than an Inuk. The Kajak-Sport rudder is useless piece of metal, but a Smart Track rudder steers just fine and doesn't slow the boat down as much. However, the Rapier is not on it's element on downwind conditions, not at least those regularly encountered at the Baltic sea and Gulf of Finland. When loaded with overnight gear, it surfs worse than an Inuk. Our club has a base for weekend trips on the small island of Skorvö nearby Helsinki. It is popular among local paddlers to try and paddle the 26 km distance between our clubhouse and Skorvö island as fast fast as possible, boat loaded with overnight gear (empty boat would be at least 1 km/h faster than the speeds below). .. and I think I know how to paddle downwind with a sea kayak AND have no problems with stability. The point is that Rapier 20 isn't very well suited to rather short wavelength of Baltic sea waves. When the Inuk can be accelerated over the next wave, the Rapier buries it's bow deep and loses momentum. I think that the reason is that the hull of the Rapier is too long and/or hasn't enough rocker. Anyway, I wouln't recommend using an Inuk for fitness paddling - I'd rather buy a Rapier 20 instead. The Rapier is much faster and more fun to paddle overall. I paddle a rapier 20, around 20kg. My friend paddles a rapier super light (dont think they make them anymore). The difference between the two boats is exceptional. I tore out the seat of the rapier because it was so low and hard on hips. I installed a bumfortable. The smart track pedals are installed so badly, at least 75 mm too low and not a good design for strong leg power and good rotation, so I installed a foot plate system. I bought a Smarttrack long rudder which slows the boat a bit but makes turning easier. Running downwind you must use edging and this takes a lot of practice in a less expensive boat in surf. I crossed the rudder cables to align left foot rudder pressure with left foot pressure for edging, took a while to get used to but works brilliantly. My deck combing came away from the deck and so I had to reattach it to prevent water ingress. I am about to install a spectacular US made pump system in it for safety offshore.